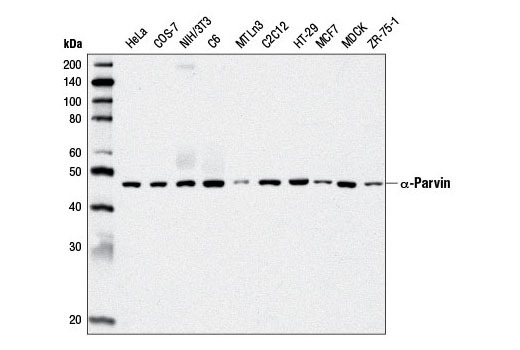 Western blot analysis of extracts from various cell lines using α-Parvin (D7F9) XP® Rabbit mAb. 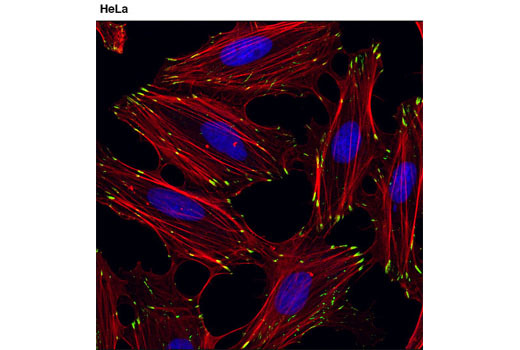 Immunoprecipitation of α-Parvin from HeLa cells using α-Parvin (D7F9) XP® Rabbit mAb. Western blot was performed using the same antibody. Lane 1 is 10% input (-). Confocal immunofluorescent analysis of HeLa cells using α-Parvin (D7F9) XP® Rabbit mAb (green). Actin filaments were labeled with DY-554 phalloidin (red). Blue pseudocolor= DRAQ5® #4084 (fluorescent DNA dye). 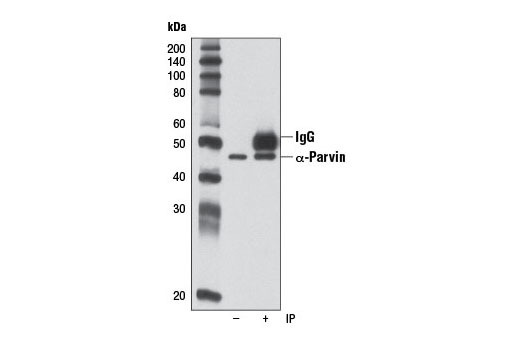 α-Parvin (D7F9) XP® Rabbit mAb recognizes endogenous levels of total α-parvin protein. Monoclonal antibody is produced by immunizing animals with a synthetic peptide corresponding to residues near the amino terminus of human α-parvin protein. The extracellular matrix (ECM) is a complex structure of secreted macromolecules surrounding mammalian organs and tissues. Controlled interactions between cells and the ECM are important in proliferation, migration, survival, polarity, and differentiation. Cells contact the ECM primarily through heterodimeric integral membrane proteins called integrins. Integrins connect the ECM to the cytoskeleton, and therefore the cell signaling machinery, through protein complexes called focal adhesions (1). The ILK/PINCH/Parvin (IPP) complex is composed of three highly conserved proteins recruited to sites of ECM contact as pre-assembled structures. The IPP acts at the interface of the integrin/actin connection to regulate formation of focal adhesions and integrin signaling. All three proteins contain multiple protein binding domains allowing them to function as adaptor proteins in the formation of focal adhesions. ILK (integrin-linked kinase) also has a catalytic (protein Ser/Thr kinase) domain, and may or may not function as a kinase in vivo. Roles for IPP proteins outside of the IPP complex have been proposed, including regulation of gene expression (2,3). The parvin family consists of 3 members, α-parvin/actopaxin, β-parvin/affixin, and γ-parvin. α-parvin and β-parvin are expressed ubiquitously, while expression of γ-parvin is restricted to hematopoietic cells (4). α-parvin binds to f-actin both directly and via interaction with the focal adhesion protein paxillin (5). α-parvin regulates cell spreading and motility through interactions with the cofilin kinase TESK1 (6), and with the GTPase activating protein CdGAP (7). Phosphorylation of α-parvin during mitosis may have a role in the regulation of actin dynamics during the cell cycle (8). Legate, K.R. et al. (2006) Nat Rev Mol Cell Biol 7, 20-31. Wu, C. (2004) Biochim Biophys Acta 1692, 55-62. Korenbaum, E. et al. (2001) Gene 279, 69-79. Nikolopoulos, S.N. and Turner, C.E. (2000) J Cell Biol 151, 1435-48. LaLonde, D.P. et al. (2005) J Biol Chem 280, 21680-8. LaLonde, D.P. et al. (2006) Curr Biol 16, 1375-85. Curtis, M. et al. (2002) Biochem J 363, 233-42.